A great song to use is called "Kindness" and it is from the album "Be Bop Your Best" by Red Grammer. This whole album is a great resource for teaching character/virtues education. For more info, go to http://www.redgrammer.com/. You can also have the children make coupon books/cards for their friends/family. I cut out heart shapes from pretty flower wrapping paper and gave one to each child to tape the edges onto the inside of their card. This made a heart-shaped pocket inside their card. 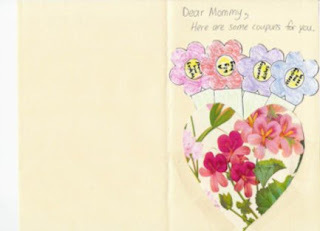 I then made flower shaped coupons for them to store inside the heart-shaped vase (pocket). The coupons could say things like, "This coupon is good for: cleaning my room." Very helpful website -- The work to put so many useful resources in one place is appreciated. Thanks!